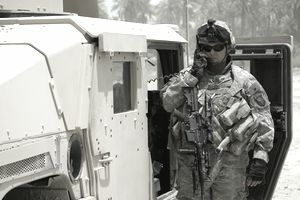 The Special Forces Communications Sergeant employs conventional and unconventional warfare tactics and techniques in communications. Trains and maintains proficiency in all Major Duties- Organizes, trains, advises and supervises indigenous and allied personnel in the installation, utilization, and operation of radio equipment, radio nets, standard and expedient antenna systems and wire communications. Proficient in and the instruction of the installation, operation and employment FM, AM, VHF, UHF, and SHF radio communication systems to transmit and receive radio messages in voice, continuous wave, and burst code radio nets. Responsible for the establishment and maintenance of detachment tactical and operational communications and communication equipment. Plans, prepares and assists in the communications targets portion of the area study, prepares and assists in briefings, briefbacks, and debriefings. Supervises the communication functions when in split detachment configuration for special operations or missions. Conducts C-E duties when task-organized in preparation (isolation) for missions and during operations, and advises the detachment commander on all communications matters. Trains and maintains proficiency in all major duties. Organizes, trains, advises and supervises indigenous and allied personnel in the installation, utilization, and operation of radio equipment, radio nets, standard and expedient antenna systems, and wire communications. Proficient in and the instruction of the installation, operation and employment FM, AM, VHF, UHF, and SHF radio communication systems to transmit and receive radio messages in voice, continuous wave (CW), and burst code radio nets. Responsible for the establishment and maintenance of detachment tactical and operational communications and communication equipment. Plans, prepares and assists in the communications targets portion of the area study, prepares and assists in briefings, briefbacks, and debriefings. Supervises the communication functions when in split detachment configuration for special operations or missions. Note: You cannot enlist with a guarantee for this MOS. New recruits interested in Special Forces may enlist under the 18X Special Forces Enlistment Option. They then attend Infantry OSUT (basic training and infantry training in one course), and their Special Forces MOS (18B - Special Operations Weapons Sergeant, 18C - Special Operations Engineer, 18D - Special Operations Medical Sergeant, or 18E - Special Operations Communications Sergeant) is determined during the Special Forces Assessment and Selection portion of their training, based on their interests, qualifications, and the "needs of the Army." 4 weeks at the Special Operations Preparation Course (SOPC) at McKenna MOUT Site, Fort Benning, GA.
30 days of Special Forces Assessment and Selection (SFAS), Fort Benning, GA.
40 days, Special Forces Qualification Course (SFQC), Phase I, Individual Skills Phase, Camp Rowe Training Facility. 4 to 6 months (depending on language), Special Forces Language School, Fort Bragg, SC. Note: The Special Forces training pipeline is inarguably the toughest training program in the Army, and has a very high wash-out rate. Soldiers who are retraining into Special Forces, who fail any of the above training courses, revert to their primary MOS (job). New recruits, who enlist under the 18X Special Forces Enlistment Program, who fail to complete any of the above training courses, are reassigned as 11B, Infantryman. Strength Requirement: No Standard Set. Must have a minimum of 24 months remaining Time in Service (TIS) upon completion of the SFQC, or be able/willing to re-enlist, or extend enlistment agreement. Must not be barred to reenlistment or be under suspension of favorable personnel action. Must not have been convicted by court-martial or have disciplinary action (such as Article 15). Must not have been terminated from SF, ranger, or airborne duty, unless termination was due to extreme family problems. Must not have 30 days or more "lost time" under USC 972 within current or preceding enlistment. Must be able to swim 50-meters wearing boots and battle dress uniform (BDU) prior to beginning the Special Forces Qualification Course. Must score a minimum of 229 points on the Army Physical Fitness Test (APFT), with no less than 60 points on any event, using the standards for age group 17-21. There is no civilian occupation that is directly equivalent to MOS 18E. However, the following civilian occupations make use of the skills developed through MOS 18e training and experience.